1. The global community has come together and collectively focussed on improving the health of women and children through the UN Global Strategy for Women’s and Children’s Health, the African Union’s Campaign for Accelerated Reduction of Maternal Mortality in Africa (CARMMA), andthe G8 Muskoka Initiative on Maternal, Newborn and Child Health. These global efforts included major policy and service delivery commitments and mobilized an unprecedented $40 billion to improve the health of women and children. 2. 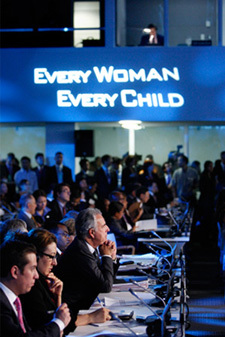 The Commission on Information and Accountability for Women’s and Children’s Health, called at the request of the UN Secretary-General, met in Geneva on January 26, 2011, to take the next step in this unparalleled opportunity to make a difference in the lives of women and children. Co-chaired by President Jakaya Kikwete of United Republic of Tanzania and Prime Minister Stephen Harper of Canada, the Commission agreed to establish a framework to monitor global commitments for maternal, newborn and child health and ensure committed resources save as many lives as possible. link accountability for resources to the results, outcomes and impacts they produce. 4. Commissioners emphasized the importance of staying focused on the core objectives of maternal, newborn and child health. maximize developing countries’ resources by aligning with country priorities, strategies and reporting cycles and by streamlining demands for information and reporting. promote these common indicators as part of a single, global mechanism for reporting on maternal and child health outcomes. recommend improved mechanisms to track and report on financial resources, both domestic and external. identify actions to build countries’ capacity to monitor and report on both results and resources and noted that stronger country capacity will be the foundation of the Commission’s success. propose a common reporting mechanism to share the results of the unprecedented commitments made through the UN Global Strategy. .
identify the most promising ways that these technologies can contribute to better measuring progress in women’s and children’s health and to improving how financial resources, both domestic and external, are tracked and reported, including through public private partnerships. 11. Commissioners acknowledged and pledged to build on the significant work already underway on information and accountability, such as the implementation of National Health Accounts and reporting by the ‘Countdown to 2015’, all of which share a common goal of holding partners accountable for their commitments to improve the lives of women and children. 12. Going forward, the Commission will draw on the expertise of its Commissioners and Working Groups. The Commission and Working Groups are composed of developing and developed country experts drawn from civil society, international organizations, and the private and public sectors who are offering their time, ideas and energy to help achieve these important outcomes. 13. Commissioners noted with urgency the need to maintain the momentum that resulted in unprecedented international support for improving the health of women and children in 2010. The Commission will reach out, including through its virtual platform, to solicit ideas on how to strengthen information and accountability to help deliver the best results for maternal and child health. Commissioners committed to mobilize support by reporting on the Commission’s recommendations and promoting their adoption to key constituencies, including civil society and the private sector, the World Health Assembly, the G8, the African Union Summit and the UN General Assembly in September. 14. Commissioners will meet again in early May to secure final agreement on a road map to ensure that the resources pledged through the UN Global Strategy and the Muskoka Initiative make a tangible difference in the lives of women and children. At their final meeting, Commissioners will agree on specific, concrete steps to advance how results are measured, resources are tracked and progress is reported. *A final report will be issued in May. Great web site. A lot of useful info here. I’m sending it to several friends ans also sharing in delicious. And certainly, thanks for your sweat!